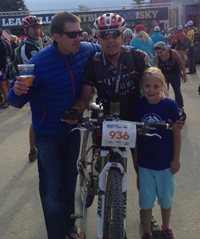 Kyle Rafford (left) greets Roger Mankus and his daughter Em-ma at the finish line of Satur-day’s Leadville 100 bike race. Roger Mankus knows the Leadville 100 like few others. As of Saturday, Mankus, 57, boasts 20 finishes in the Leadville Trail 100-mile mountain bike race—out of the 21 times the event has been staged in the high-altitude hills of Colorado. The Ketchum man finished Saturday’s Leadville 100 in 11.32:39 for 169th place in the Men’s 50-59 age class and 1,091st overall of 1,282 bikers. The Leadville Trail 100 Hall of Famer and local legend earned the coveted 2,000-mile belt buckle award given to those who have completed 20 of the “Race Across the Sky” events. Only three others have also earned the 2,000-mile belt. Remarkably, Mankus’ finish on Saturday was almost identical to the 11.29:33 finishing time he posted at the inaugural Leadville race in 1994. At that event, he was 37 years old, from Texas, placing 86th of 113. His Leadville times in recent years have been remarkably consistent—11.25:29 in 2013, 11.26:14 in 2012, 10.50:08 in 2011, 10.44:56 in 2010 and 10.43:22 three years ago in Colorado. In a Jan. 2013 Web site write-up naming him as Elephant’s Perch “Bike Shop Employee of the Month,” Mankus was described as coming to the Wood River Valley from Chicago by way of Texas and New Mexico. “Roger has been a UAW employee with Ford at a plant in Illinois, is a veteran of the U.S. Army and has advanced training in massage from one of the country’s best schools for the healing arts,” it said. The account went on, in condensed form, “He has competed in all but one of the grueling Leadville 100 mountain bike races—having had to sit out one because of a broken femur. He has been a multiple-time competitor in the Race Across America. He has crewed on RAAM for a multiple athletes. Two other locals raced in the 21st annual Leadville 100. Winners were Todd Wells, 38, of Durango, Co. in 6.16:27—his second Leadville victory—and by repeat women’s queen Sally Bigham, 36, of Great Britain in 7.23:58, seven minutes off the course record she set last year at Leadville. She was 26th overall. There were 112 women and 1,170 men finishing. Third last year, Wells (6.16:27) won a close battle by 17 seconds over fellow Specialized racer Christoph Sauser, 38, of Switzerland, the 2008 world mountain bike champion and 2000 Olympic bronze medalist. Placing fourth was two-time defending Leadville king and course record holder Alban Lakata, 37, of Austria (6.29:51). Four-time Leadville 100 women’s champ Rebecca Rusch, 45, of Ketchum and Specialized competed Saturday but elected to kick back while promoting her newly-released book “Rusch to Glory,” written with Selene Yeager. Rusch, runner-up behind Bigham in 2013 at 7.35:27, placed eighth among women at 8.39:38 and fifth in the Women’s 40-49 class. She was 206th overall. Her co-author Yeager, 45, of Emmaus, Pa., was sixth among women at 8.39:19—thus breaking the coveted nine-hour mark that was an objective of her and her veteran pacer, Rusch. Another local finisher was Kyle Rafford, 46, of Ketchum in 8.30:48 for 48th place in the Men’s 40-49 class and 157th overall. It was Rafford’s first Leadville 100 finish. One of the world’s most punishing races with steep climbs and descents, the Leadville 100 begins at 10,152-foot elevation and reaches 12,550 feet at Columbine Mountain.